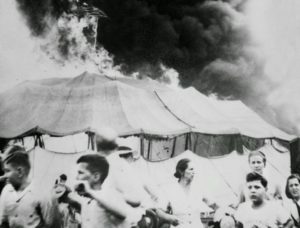 Judith survived the “Great” circus fire of July 6, 1944 — she talks about that as well as her childhood growing up in rural dairy farming area (Bloomfield Ct), her neighbors, and even Mr. Webster the local butcher. She talks about surviving the great Hartford circus fire including her rescue and the aftermath (starting at the 00:08:23 mark). Judith considers herself to be the “girl in the little yellow pinafore dress” written about by Henry S. Cohn. 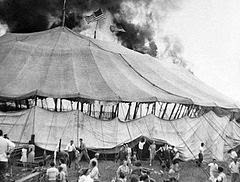 (The Great Hartford Circus Fire: Creative Settlement of Mass Disasters Yale University Press, 1991).